Part one of six clinical service accreditation resources. This particular resource has been produced by the former Clinical Service Accreditation Alliance (CSAA) in partnership with UKAS. 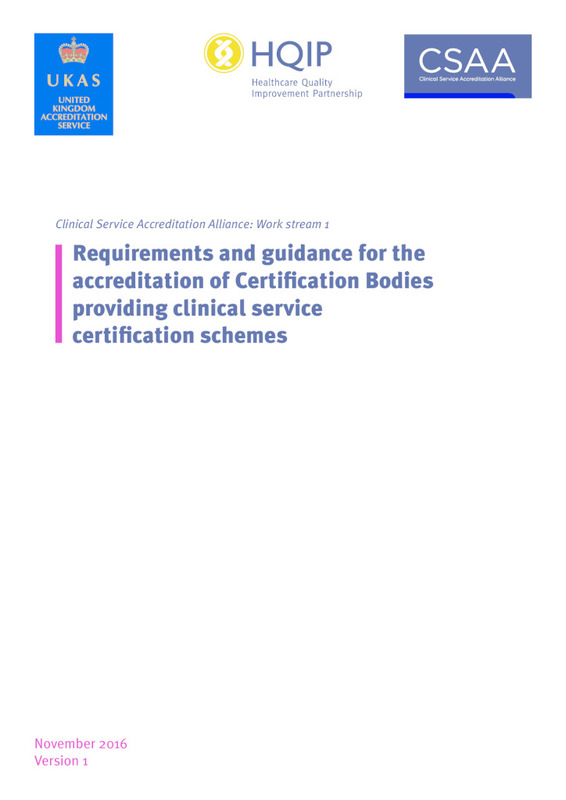 This document provides the requirements and guidance that can be used for the accreditation of Certification Bodies that operate clinical service certification schemes. It sets out requirements and relevant guidance to assist Certification Bodies and UKAS, where a Certification Body seeks accreditation. The accreditation award will be ISO/IEC 17065:2012. The requirements contained in this document can also be used to inform decisions by regulators or other health improvement institutions. As well as HQIP and UKAS, this guidance is further underpinned by the International Society for Quality in Health Care (ISQua) Guidelines and Standards for External Evaluation Organisations and Guidelines and Principles for the Development of Health and Social Care Standards. ISQua has extensive experience of improvement in the quality and safety of healthcare worldwide, supported through external evaluation and other mechanisms. This guidance does not seek to replicate any part of the standards developed by ISQua but acknowledges their expertise in the healthcare arena and specifically their standards. The full Certification Body Requirements resource is available to download below.